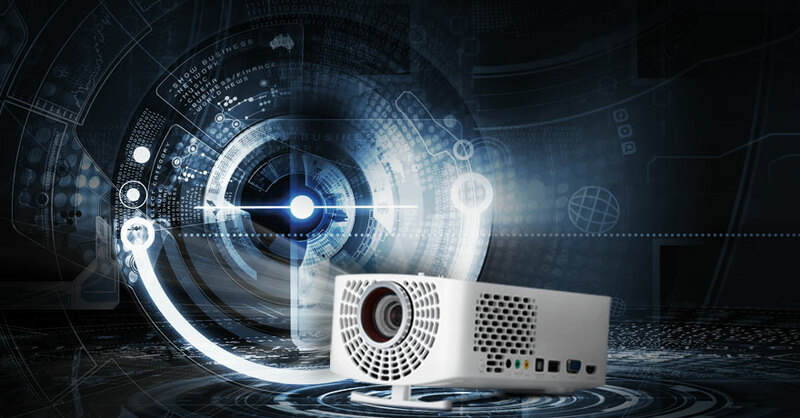 The finest portable LED projector ever experienced. 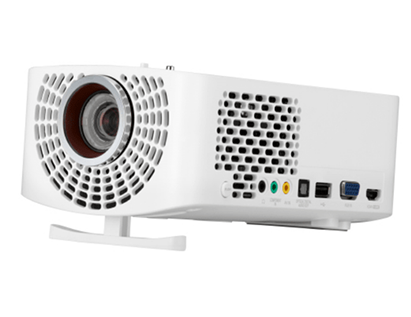 The LG Minibeam PF1500G 1400 Lumen Full HD Portable Smart LED Projector is the finest LED driven projector ever developed for you to experience clear crisp detailed images, and portability that is smaller than your typical loaf of bread.LG PF1500G has powerful picture quality with FHD(1080P) 1400 Lumens. Wireless mobile connection, Bluetooth sound out. The LG Minibeam PF1500G offers clear 1080P picture quality with 1400 Lumens high brightness, 150,000:1 contrast ratio, LED light and triple XD Engine.Innovative 1400 Lumens high brightness provides more clear visibility. With 150,000:1 contrast, it presents impressive white and black achromatic colours. LED light source that generate colour through red, green, blue separated light source, gives 114% vivid chromatic colour than conventional lamp projectors. Triple XD engine, the essence technique of half century history LG TV, adjusts picture more clearly to represents picture more naturally. 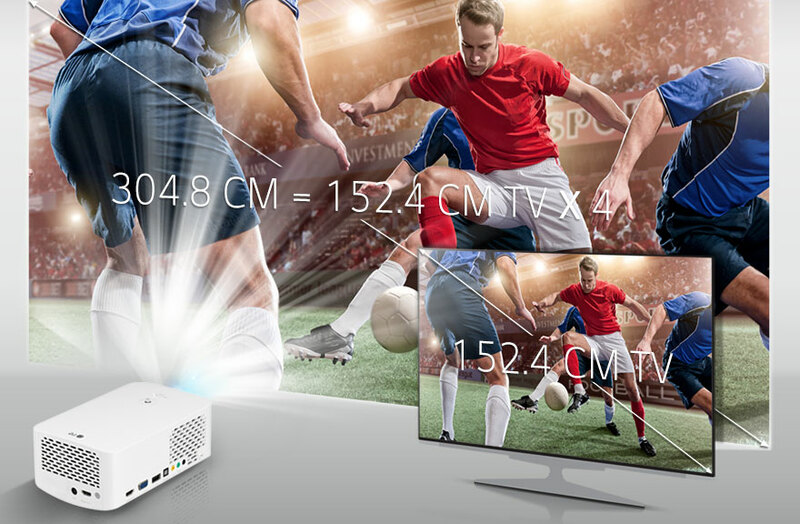 LG Minibeam Pro, PF1500G gives you an cinematic viewing experience with up an extra large 304.8 CM class size. 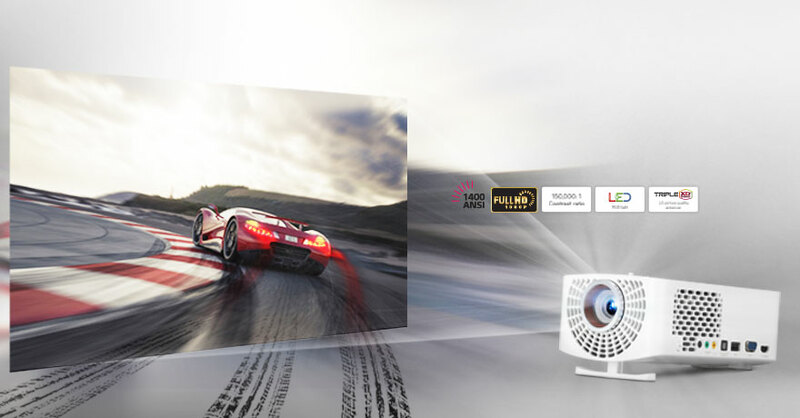 The sheet size of the projector, which is equal to four 152.4 CM TV’s, will make your home cinema experience so immersive you will feel like you brought the theatre into your home. 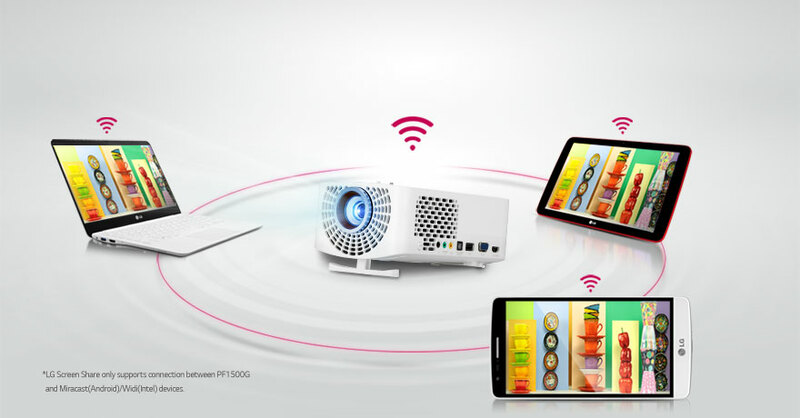 Unlike conventional projectors, LG’s Screen Share provides wire-free experiences when connecting PC, smartphones, or tablets. 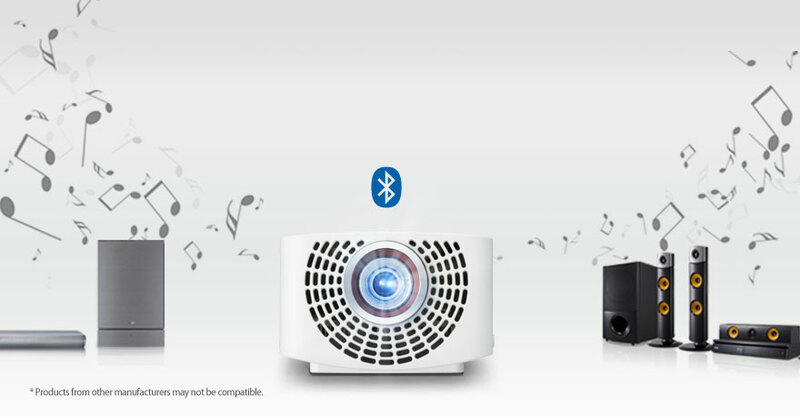 Wirelessly stream sound directly from projector to LG Bluetooth compatible sound system like home audio, headphone and portable speaker for a seamless listening experience. The LG PF1500G provides 1.1x Zoom and 4corner keystone for easy installation. It corrects distortion and missed distance of picture. 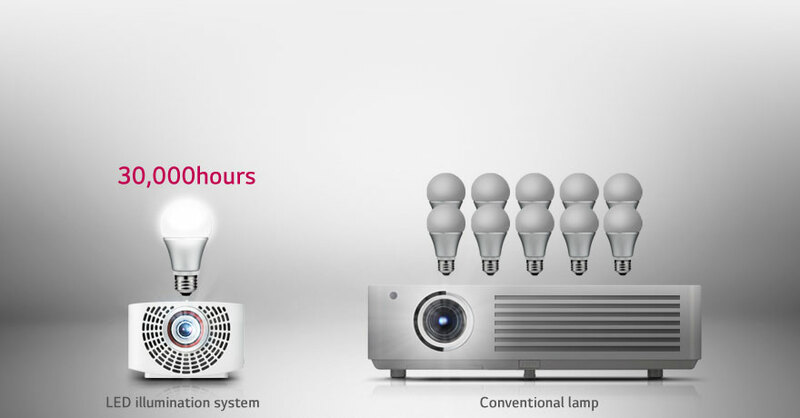 LG’s LED light lasts for 30,000 hours. It means you can use it 20 years when using 4 hours a day. Don’t spend lamp replacement cost anymore. • MHL(Mobile High-definition Link)HDMI Shared-MHL enabled Android Smartphone or Tablet & MHL cable required (sold separately). 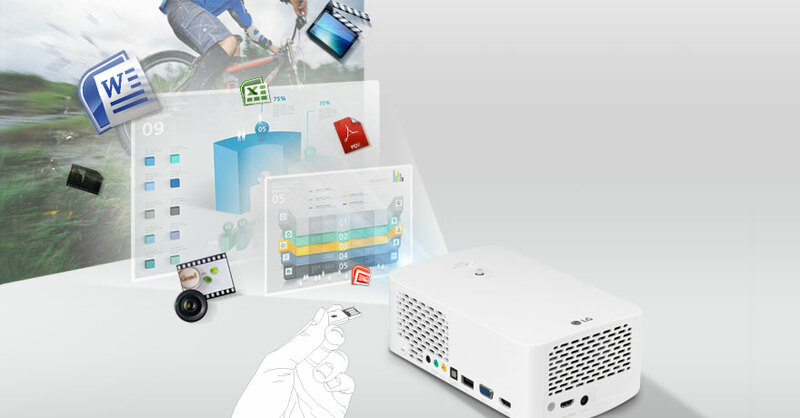 • Intel's Wireless Display (WiDi®)- Intel WiDi® enabled PC must be in range of the projector. • Bluetooth® Wireless Audio Output- Uses Bluetooth® technology to send audio to Bluetooth® audio devices. • Miracast- Miracast compatible Android device required for this feature.